We are excited to see you tomorrow at the 2014 Preservation Summit. If you are concerned about getting to the event we have created some instructions that should help you to find our events throughout the day. We reccommend parking at the Capitol Visitors Parking Garage at 1201 San Jacinto located between Trinity and San Jacinto Streets at 12th and 13th streets. Parking is free for the first two hours and $1.00 for each half hour thereafter (maximum daily charge: $8.00). This is a map of the Capitol Building and Surrounding Area, it has been marked to indicated the different buildings and areas that we will be in throughout the day. First we will meet in the Auditorium, which is in the Extension Building of the Capitol, Room E1.004. This building is indicated by the second star on the Map. We will also be serving coffee in the House Members Lounge (E2.1002) it is located directly beneath the Auditorium. Below is a map of where the Auditorium is within the Extension Building. After that we will proceed to the South Steps of the Capitol Building. This is Point Three on Capitol Map. For Lunch and the speakers we will return to the Extension Building (Point Two on the Capitol Map) to the Capitol Grill. The Capitol Grill is directly across from the Auditorium. 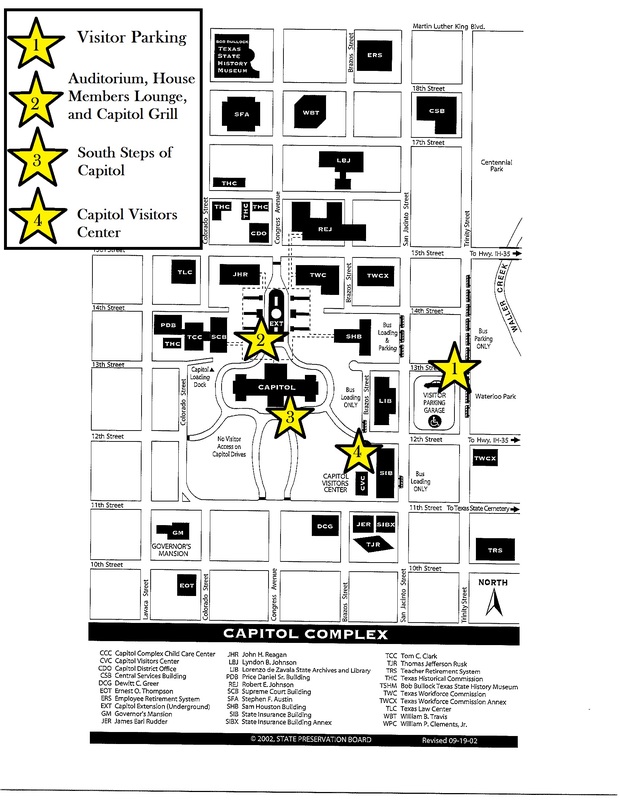 Finally, we will have our evening reception at the Capitol Visitors Center, this is point four on your Capitol map.